Choosing from what may seem like an infinite number of kitchen color schemes can be both thrilling and overwhelming. Cabinet colors: More often than less, kitchen cabinets usually take up approximately 50 percent of your budget and take up about 40 percent of the visual space in a kitchen. 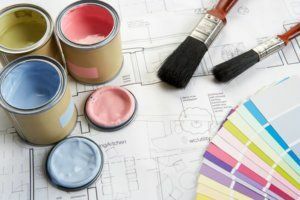 Therefore, it’s best to start the process by choosing a cabinet color that fits your personal style before deciding on the other colors in your kitchen. Appliance colors: Your cabinet order should not be finalized until you know which appliances you want to buy. As focal points, your sink and appliances can have a big impact on your overall color scheme. Flooring colors: When picking a kitchen floor color, it’s important to make sure that it coordinates well with the cabinets, countertops and appliances, as well as with the floors in adjoining rooms. Wall color: The kitchen walls play a vital role. While they are often concealed by cabinetry, try to pick a color that balances well with the floors, cabinets and backsplash. Countertop colors: Your kitchen countertops occupy a large portion of your visual space. Be sure to bring a sample of your cabinetry color to help you choose a complementary countertop color. Backsplash color: There are many backsplash options that can either coordinate or clash with your color scheme. If you need extra help, don’t hesitate to enlist the services of a designer when selecting a backsplash. Still feeling overwhelmed? Take a step back and consider the overall effect you want. Are you hoping for a bright, welcoming kitchen or a luxurious, high-end, gourmet effect? At Republic West Remodeling, we can help you design the kitchen of your dreams. We have vast experience providing support to countless Phoenix kitchen remodeling projects. Call 480-481-9595 for your free consultation, or visit our showroom today.